Went up to the allotment on a dry-ish but damp evening and ended up with 14oz raspberries and a few others too. They are really steaming away now – glad I netted them though! Another bunch of sweet peas too, and the climbing French beans are producing already, which will compensate for the runners being their usual sulky selves as regards setting. The dwarf Frenches are in full bloom, and so it's anyone's guess whether they turn out yellow or green. 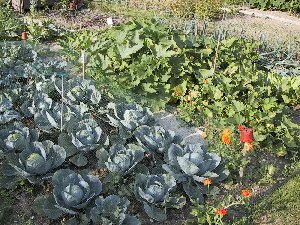 One thing for sure – they're a lot better plants and a lot further forward than last years', so another roaring success for the heated propagator. Another dry day after two more days of on-off rain, so went up to allotment with several takeaway boxes and the intention of picking at least one of the blackcurrant bushes. It took ages – and three full boxes – just to pick over one of the two netted bushes. This one was so covered that the branches were initially horizontal – they are now somewhat more vertical but not sure if they'll recover for a while! This is the bush with a lot of new growth from the base, so the branches may well get pruned out in the winter in any case. The other one isn't quite as prolific this year, but not far off. Though goodness knows where I'm going to put the berries until freezer 2 is switched back on in September! It's bad enough having four full tubs of blackberries still… but they can be eaten! Hoed quite a few sections, dug up another pound or two of spuds and cleared the autumn onion bed. Most of them didn't bolt, so are storable for a few weeks while we eat the other ones that did bolt and are definitely not storable! Pulled up the rest of the garlic Marco and cleaned them off, so they can get strung up easily. Also pulled up a thermidrome just to see what it looked like (much less purple!). Those and the much later planted long keepers can stay in the ground for a few more weeks – not as if we'll need any garlic for a while! The summer onions are totally amazing – the bulbs are uniformly large already. I will have a decent crop this year by the looks of it. Thinned out the beetroot and the chinese cabbages, and picked a yellow UFO courgette. I also have a couple of Table Dainty marrows coming – one of them is about 4" long already. Pity the beans are so far behind! The summer cabbages have come on in leaps this last week, and are heading rapidly. Picked another tubful of raspberries and on the way out, discovered another way to get into the middle of the redcurrant patch, so have quite a few more of those as well. And more sweet peas. In a way it's as well they only last a week, as otherwise I'd be overrun with them! The only sad thing today was picking the Webbs lettuce and discovering it was mush in the centre thanks to two industrious slugs. Yuk. Upon weighing the berries it turns out I have 2½lb blackcurrants and another 11oz raspberries. Pulled the 20 or so remaining thermidrome garlic (some cloves were huge!) and another potato plant. They have gone over now – need to get rest up in the next week or so. Got two bunches of sweet peas and lots of marrowlets (too big for courgettes!). First Table Dainty marrows too. Found two marrows which should be large enough to take home for next weekend, and picked a pound of yellow beans (Yes! They came true to type!) as well as 13oz green ones. Raspberries are just about still going; got another 11oz of those (though quite squashy after not having been picked for a week). 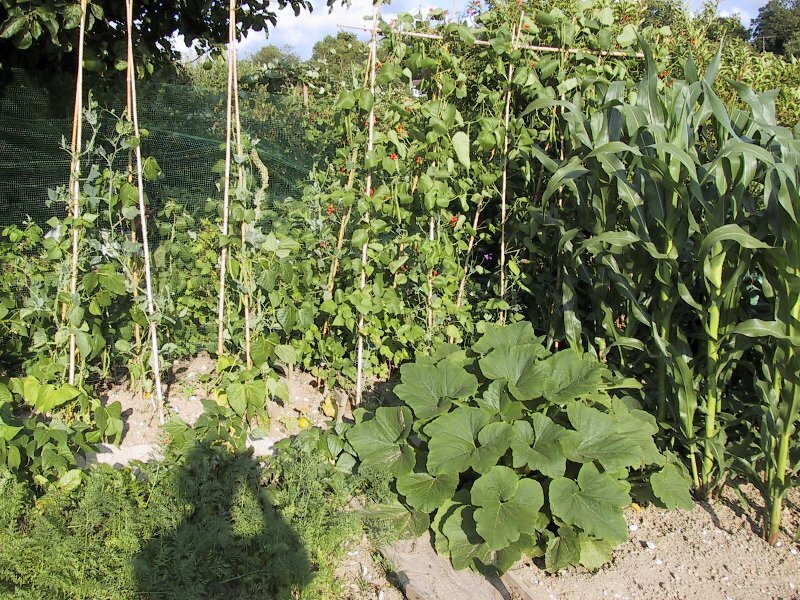 The runner beans have set, and I expect to get the first pickings inside a week, so again perfect timing for going home. The summer onions have started to bend over and go orange skinned – urk – didn't expect that quite this early. I suppose this is because of the heat. But they are still reasonably large sized bulbs. Have cucumber central in the conservatory, despite picking some before I went to Canada. Took one round to Ursi. 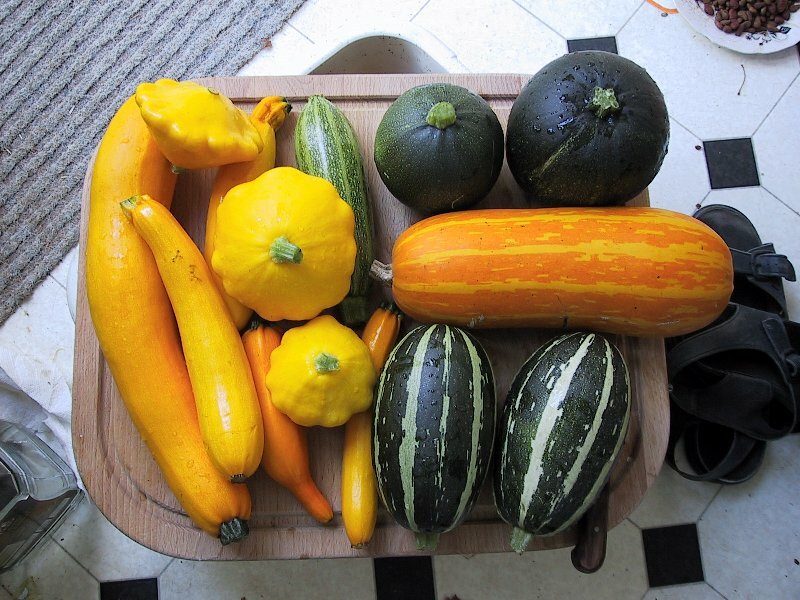 Marrows already cover the large chopping board, though I managed to prove a point – the horizontal yellow one is a Table Dainty stored from last year… so they do last!!! Cleaned up and plaited the garlics and hung them to dry in the shed. Froze the beans, raspberries and some of the courgettes. The fun thing here is that the horizontal yellow marrow is actually the last stored Table Dainty from last year, which I saved for a laugh. Up to allotment after church, to do a quick soaking of the marrows, and discovered an unsuspected third LGT under the foliage. A *much* bigger one than the others. It's going to be a bit big by next Friday… Picked three yellow courgettes, gave them away and took home two more custards anyway and another bunch of sweet peas. They are getting much shorter stems on, sadly, but I think I've got all of the seedpods off now. Finally have the answer to the query of June 25th: the plant that wasn't a custard marrow is the acorn squash. A Table Dainty was mislabelled too, and in the middle of the trailer patch is a socking great custard marrow, which is a bush. And taking over, as is the other one. Next year I plant these away from the rest where they can turn into triffids on their own! Rain! More of it at home than work, thank goodness. Several brief downpours in the day, so not too much, but heavy when it did come down so it had time to soak in. Hopefully the garden will appreciate this. 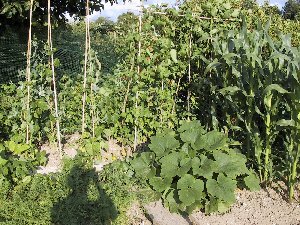 Out for a weeding session, as they are beginning to take over the plots again and I don't really want that! Started off by clearing the autumn onion area properly, then digging a hole, adding manure and sticking in the last butternut squash. Doubt it will do anything, but at least it's out of the C. Moved on to the summer allium bed, and weeded it. Also had a go at the manure heap. That stuff's now like concrete on top! But now has fewer dandelions. One of the gooseberries has definitely layered itself, so that can get cut off and planted somewhere else. The comfrey cuttings have taken – two of the pieces now are the centre of a clump of leaves. Goody. Picked what I think are the last early summer raspberries, and noticed the first ripe Joan J. Ate it with a Glen Ample and they really are quite different. They should keep going in dribs and drabs for a month or two. Still have blackcurrants which need picking. Dug up some more spuds: nearly done, now. Still need to weed the cabbage plots desperately, and finish off the potato area. Dug up a Topper shallot to see how it had done and nearly fell over. The tops are deceptive – they are more globular than I realised and there were 20 bulbs in the single cluster! Will have plenty for eating and for next year, then! The Jermors look good, too, though not quite as prolific! The supersweet sweetcorn are flowering: the minipops aren't, so I don't have to worry about cross-pollination. I find it funny that the minipops are bigger plants by far… Picked a few runners, as otherwise they'd have gone stringy. And I finally catch a poppy in flower – I have deep red, black-blotched singles. Watered stuff, especially the marrows. Couple of globulars today but not really any others, unless I count the three lurking full-size marrows which I won't cut till Friday so I can take them up to Mum and Dad. Waitrose currently has much smaller ones for 95p each. Wet! After days of dryness, it finally rains, and it pours… Went to pick over the first crop of runner beans and the first marrows, and got somewhat drenched despite the golf brolly. I am so glad of the carpeted paths now! Picked the beans, a lot of French beans too (still lots to be picked off the dwarf bushes) and then got a large courgette as well as the three marrows. All very nicely sized – not too big so they should be very tasty. 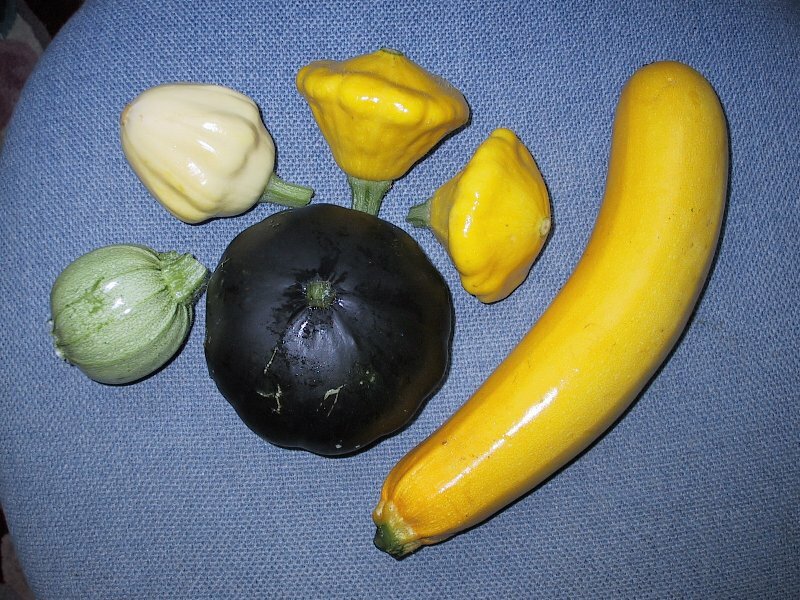 I have to amend the story of the giant plant in the trailer bed yet again – the little yellow things are now turning more elongated than the custard marrow, so are indeed the missing acorn squash! In which case the green thing by the sweetcorn is a mutie – can't possibly be anything else as it's green and custard-marrow shaped. Accidentally crossed with something else I reckon. The last butternut is looking happy – has perked up nicely. Dug up two clusters each of the shallots, and found the Jermors are indeed the right size. Still pleased with the number of Toppers. Dug the biggest potato up then decided it was just far too wet to get a lot of onions for Mum, so pulled a few of the tiny ones that were being used as fillers, and then legged it for the motorway. 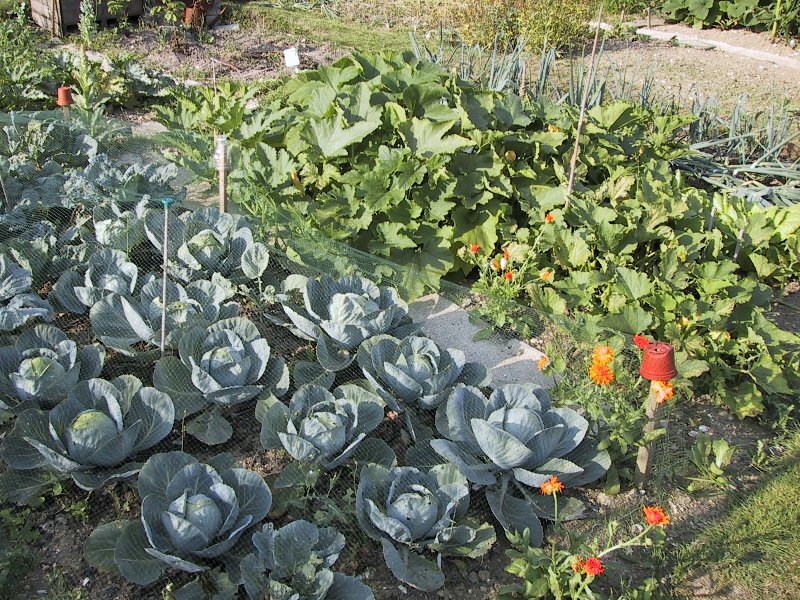 Pouring down with rain again – just as I finally run out of lettuce and have to go and cut one. Oh well – ended up with two more custard marrows, one gold rush, a de Nice, the mutie green sort-of patty pan and an acorn squash. Quite an amusing photo! Had no idea if the acorn could be eaten this small, and Marshalls currently don't have a website with catalogue on. However, after resorting to the Wayback Machine (which doesn't work properly under Netscape!) I managed to extract one of the old catalogue pages with descriptions on. Can eat at tennis ball size or leave to mature and store, so that's ok. Ate it. Not as bitter as some courgettes: I guess the flavour is rather better at full ripeness! Lovely day today in comparison, and so decided to get on with the weeding and strimming. Took photos at around 6pm before I'd done anything as I figured it'd be too dark later. 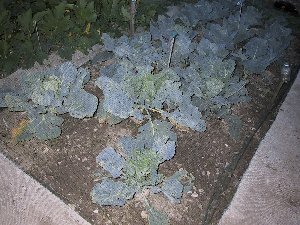 Quite scary cabbage beds. Started up the strimmer and whizzed about for a while, putting paid to next doors's nettles while I was at it. 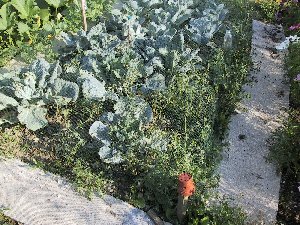 With luck it won't have grown much by the next inspection… Much easier to walk about the plot by the time I'd finished. 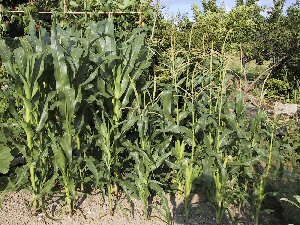 Sweetcorn - compare with June 24th! 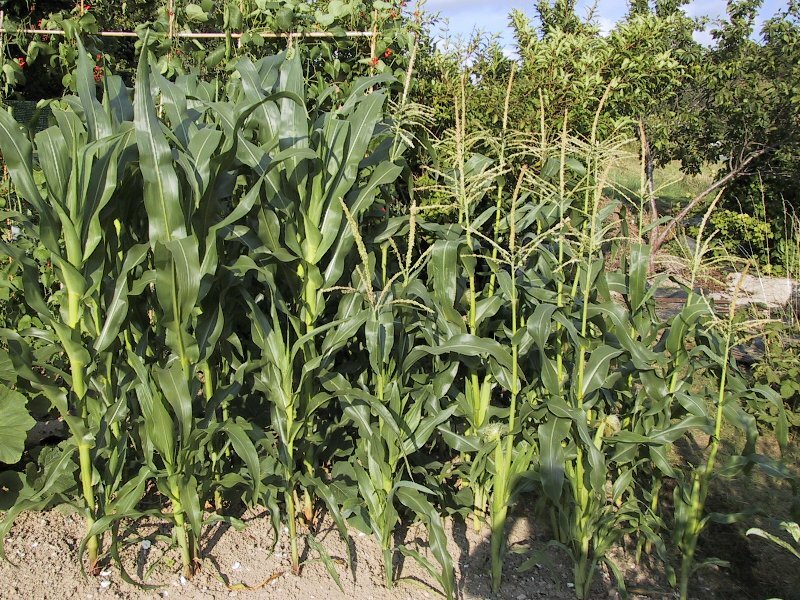 The baby corn are the huge plants, the full size cobs, the smaller. Go figure. ...and again a couple of hours later.